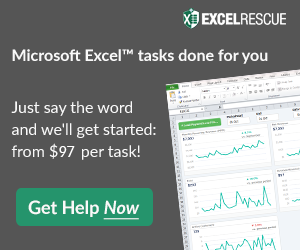 Okay, when you are making your Excel Dashboard Templates you will spend a lot of time settin up formulas and copying them to other cells and ranges, so you probably want to make the Dashboard more QUICKLY, right? Something that took me a long time when making my Dashboards was entering the “$” when making absolute references in a formula. But there is a quick way to reference to a cell or range without typing in a single “$”? When you type or click a cell reference (like A1), simple press “F4” for an absolute reference and press “F4” again to toggle thru the various absolute and relative references available in Excel. There you go, you never have to enter another “$”. Don’t know what an Absolute or Relative Refernce means in Excel and how to use them in your Dashboard Template? Then you MUST tune in for the next post. Previous articleWelcome to the New Microsoft Excel Dashboard Templates Blog where you will learn how to make Dynamic Charts, Spreadsheets and Dashboards!